Central Station - Piazza Indipendenza - Piazza San Marco - Piazza della Libertà – Piazza delle Cure - Piazza Edison - Camerata - San Domenico – Regresso – Piazza Mino da Fiesole. 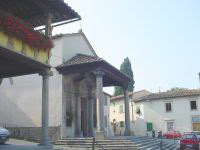 The church of Santa Maria Primerana, built on an Etruscan fundament, was already known in the year 966. Enlarged during the Middle Ages, a new façade was built at the end of the sixteenth century. The high alter has a small painting on wood with a Madonna and Child by Maestro di Rovezzano. The transept has two bas-reliefs by Francesco da Sangallo. The glazed terracotta from the workshop of Andrea della Robbia is admirable. On the second Sunday of May, the Podestà, or Administrator of Justice, and the leaders of the population, or Gonfalonieri, came here to take the oath of office. The Badia Fiesolana and the Amphitheatre should be visited. On the west hilltop is the Francescan Church and Monastery, where ladies were not allowed to enter. In the 15th century the Alessandri family, who owned the nearby castle, built a bell tower on which is placed their stone coat-of-arms. The family enlarged the church at the end of the 18th century and its orientation was changed when the façade was built in place of the apse. Over the window is a two-headed lamb and on the tower a curious demon-like blowing two fanfare trumpets. There is a terracotta bust representing San Lorenzo and of the a Madonna and Child, attributed to Rossellino, 12th cent. On the outer wall are a number of commemorative plaques to eminent sojourners, including such names as Queen Elizabeth and Beatrice, Battenberg, Hohenlohe, Hohenzollern and the Duchess of Russia. The castle was little more than a ruin when in 1855 John Temple Leader bought it, and much of the land and a large number of crumbling farmsteads and churches in the neighbourhood, and set himself the gruelling task about restoring all of his property. “The aforesaid bird, aided by the wind, shall rise to a great height; and in this will be its safety. Should any act of overturning intervene, it will thus have time to regain its equilibrium, when its limbs are of great resistance so that it may withstand the fury and impetus of a descent with the aforesaid precautions and its strongly mounted joints and its nerves of strong raw silk; and with no interference of iron parts, as soon these will break under pressure, or will be subject to wear, and therefore we should not employ them. Be reminded that the bird shall not imitate any other than the bat, as the membrane affords a structure, that is a connection for the structure, the mainstays of the wings. Should you imitate the wings of feathered birds, they are of stronger bone and nerve to be perforated; that is the feathers are disunited and so let air pass through. But the bat is helped by the membrane, which ties all together and is not perforated. The great bird will rise to its first flight over the summit of Cecere, filling the universe will awe and filling with its fame all writings and with eternal glory the nest where it was born. From the mountain which bears the name of the great bird the famous bird will take flight and fill the world with its fame”. The church and monastery were begun in 1406. Construction was interrupted any times due to a lack of money. Donations throughout the years by eminent families brought the work to an end, though the church has undergone several changes. Its monks included Sant'Antonino, Fra Angelico and Domenico Buonvicini, the hapless companion of Savonarola. …even I feel in me to have suckled in with milk the love for sculpture in Settignano where I was raised, and where part of the inhabitants are sculptors… Michelangelo. Before setting out, the best way to interpret our walkway from Fiesole round Montececeri and back down to Florence, is to observe it from afar. Take a bus up to Piazzale Michelangelo, one of the most frequented landmarks of the city. From the front balustrade of the Piazzale, look down over the river Arno to the cupola of the Cathedral, and then directly up to the horizon. Fiesole crowns the hilltop in the distance, and beside it, to your right, is Monte Ceceri. It was from this platform that the “first human flight” was attempted following the designs of Leonardo da Vinci. Facing the river, walk to the left and round the balustrade until you come to a flight of steps leading down to a small piazza. At the end of this area is a board-map showing the most illustrious buildings of the city. A century ago, the walk uphill from Florence to Fiesole was only for the energetic; the electric tram was tedious and long-winded, and downright punishing for the horses dragging their carriages of goods and passengers. 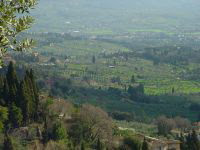 Every Latin historian had something to say about Fiesole. Rambling and strange at times as their stories might seem, they do contain a grain or two of truth. Some asserted that it was built by the Tirreni, others by the Pelasgians, or even by the Phoenicians. It was certainly one of the richest and most powerful of the Etruscan cities. Inevitably, the proud Roman clarion echoed one day along the Arno valley up the hillside and the inhabitants of Fiesole were either slaughtered or ordered to genuflect before the invincible Legions. After the fall of Rome, it was subsequently plundered several times and lost its peculiar qualities. On the old Etruscan and Roman ruins and monuments the new town was slowly built. I cast a palm-leaf into the sea: The waters devour it. I see others cast lead, and – Lo! For them it sails. On the way up today we pass old wayside churches, shrines, crosses, great villas once frequented by the Medici, illustrious artists and writers, now oppressed by modern hi-tech buildings in what seems intentional defacement. To the footsore pilgrim with sturdy pastoral staff and dusty burlap outfit it was a day’s walk to the top, up those exceptionally steep stony paths, still in place, which remind one of far-off effort and accomplishment. The wayfarer has given place to turbo buses pouring out streams of camera-burdened tourists. At present, an open square, some narrow streets, pleasing to the attentive eye, and a number of aesthetically attractive buildings form its personal façade. Indeed, one can find some cloistered nooks with a water-colour artist at work and a gathering of shadows with a writer. A few steps out of town one can come across the typical Tuscan farmhouse with a vine loosely drooping over the doorway. Our walk now begins. The roads and paths ahead are copiously way-marked with these red and white CAI blazes. The tight little lane climbs fairly steeply for a few minutes between villas and houses of refined composition and artistry until it levels out at the top. Don’t be too ambitious. Enjoy a relaxing leisurely pace. On the right is dramatic view over Florence and the background towards the Chianti hills - a sight to slake the thirst of any romantic soul. From this point the city is best seen at dawn or in the evening when the sun is low and the background hills present a sharp edge against the western sky. Walk forward along the straight gravel footpath leading towards the wood. After 200m you come to a board on the right showing a map of the park. The path now takes you through the wood. Swing uphill to the left at the first Y-junction, always bearing in mind to follow the red and white CAI blazes on the trees or rocks, disregarding the blue-red marks. Turn right after 50m. It takes about 10 minutes to reach a handrail on the right and wooden bench on the left. An excellent view over the Arno valley. The Florence soccer stadium is straight down in front in the foreground and the Cathedral and Palazzo Vecchio are just over to the right. Downhill again, you come to the first stone quarry on the left. A dark sinister hole in the hillside, worthy of a short visit. 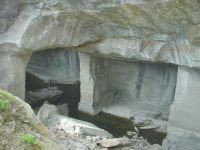 These quarries were still used until the 50’s. At the nearby 3-pronged junction, take the middle path on the same level that swings to the left. Do not walk uphill to the left or take the right downhill path. Keep following the red and white blazes. The path dips down, the ground is rough, but you soon come to clearing in the wood where you take left turning uphill. Again, we can see the frequent blazes on the trees. Look up to the left, up to the cypress trees on the hilltop to get your bearings. Ten minutes uphill, keeping the hilltop to your left, you come to the red-and-white marks on the rock in front of you. This time take lefthand path to Montececeri, past a quarry up to the right and at the first Y-junction take a few steps forward, then to the left along a short path for a striking view from the top of the quarry face over to the distant hills and down to the valleys. Retrace your steps and follow this path with the red-and-white marks and after 10 minutes there is an uphill stretch along a wooden handrail and stone steps. The path spirals round to the left until you reach Piazzale Leonardo. A few benches and tables are available for rest and picnics. The board shows its history. Leaving the Piazzale, take the wide path along the garden wall on the left which leads downhill for a few minutes to a mapboard, where you turn left. Pass the road barrier and soon a small open area of hard ground comes into view on your right with a quaint little church on the corner. This is Piazza dei Pini and the parish church of Borgunto, seated like a seer in the midst of heathendom, which like so many woodland churches, may have been built on the very spot set apart for sacred and solemn rites in honour of some ancient pagan god of the soil. This is Via Peramonda, perhaps anciently a military road or a trade route. After a few strides along this road you will see the entrance to a Fiesole Camping Site on your left. Proceed downhill now. A keen eye can enjoy the views over the hills with their large farmsteads and elegant villas which beckon us to discover them. Turn right when you come to the main road about 20 minutes later. Walk on for 200m to the bus area on the right, which is little more than a clearing at the roadside. Turn down into the wood from the top side of this area and follow the path running parallel to the main road to the left above it. This path through the wood will soon meet a narrow road at a T-junction where you must turn right. Now walk straight on. Do not turn right after a few paces towards a barrier across the track. Look carefully for the CAI signs on the tree as you enter this rough stony way, suitable for cartwheels and the cloven hoof. Walk on, there are tall rushes on the right, until you come to a once admirable, yet still dominating, wayside shrine up on the wall to your left. One of the thousand tumbling wayside shrines in Tuscany, worthy of a scholar’s quotation or an artist’s affection. The face of young cherubim looks down with mock humility as if offering a prayer for burdened wayfarers with a long road behind, and nowhere to go. In those days gone by a place of worship, rest and refreshment; a meeting point for trivia where you can still meet a farmer with a loaf of bread under his arm, an onion in his hand, and the neck of a small wine bottle peeping out of his pocket. Walk past a forlorn-looking farmstead further along the road, down along the cart track through an olive grove. These tracks can become muddy after some rain and are better suited for cartwheels and the cloven hoof. Until a few years ago one could meet beasts of burden tramping along here, and those great white oxen, slow, swaying bodies, already worshipped two thousand years ago as the incarnation of the earth-gods. And to those also, O Lord, the humble beasts, who with us bear the burden and heat of the day, and offer their guileless lives for the well-being of their countries, we supplicate Thy great tenderness of heart. When you get to the end of this first stretch, head towards the wood. Don’t take the right-hand turn downhill. The walk through the wood is brief. In the morning a dew-laden spider’s web lays itself across your face and a keen eye can find regurgitated owl pellets of slimy fur and half-digested bone. at the end the path comes to another old, crestfallen farmhouse with a yard and outbuildings. Walk round it, down between rugged dry walls and along a track covered with Summer dust waiting for September winds to make a sally and bare its humps again. After 10 minutes it leads uphill and on to a narrow asphalt road. Turn right, downhill to the roadside church of San Lorenzo. Across the valley are the quarries of Maiano where Walkway One passes. A few minutes down the road is the eye-catching Castle of Vincigliata. On the high outer walls are stone tablets commemorating the sojourn of names such as Queen Elizabeth and Beatrice, Battenberg, Hohenlohe and Hohenzollern and the Duchess of Russia. At the first sweeping bend after the castle, take the track on the left through the olive groves. There is comfort and security in long, straight paths. Life flows smoothly on. But the Genius Loci appears from behind sudden dips and bends and lives under the uncontaminated blank spaces on the wayfarers map. Walk slightly uphill to the large renovated building on the right with its chapel standing on the ground opposite. The view from here over the olive groves and cypress trees towards Florence in the background must surely be one of the deepest emotional admiration. Note the marks on the wall to the right. Walk straight forward along Via Desiderio da Settignano, past the cemetery on the right, uphill a little between the first houses of the town to the junction with Via S. Romano. Turn right and proceed down to the Piazza. Look at the curious façade of the Società Corale, a building on the right just after the very narrow part of the street. Of what we can remember of the road." Bus number 10 from the piazza takes thirty minutes back down to Florence.